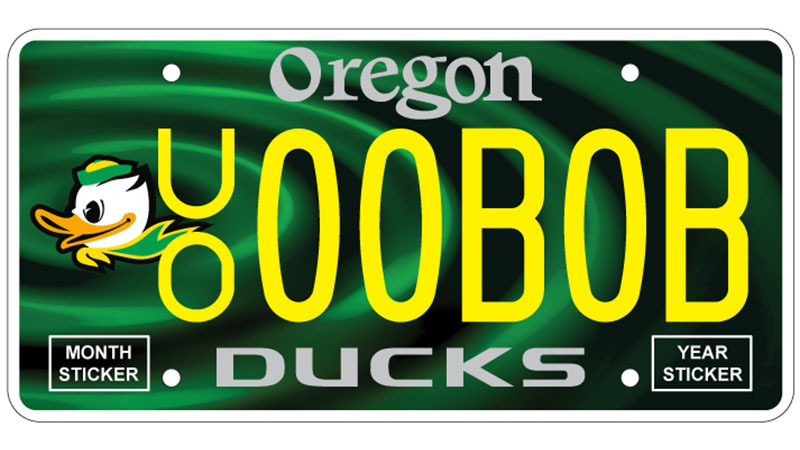 Sales of the UO Alumni Association’s new University of Oregon license plate have reached the minimum threshold to go into production, and thanks to a generous contribution by a donor, UO employees and their friends and families can get a set of plates at no charge for the initial transfer, a savings of $40. The plates were designed by Nike’s Tinker Hatfield to symbolize the effect of ripples in a pond and Ducks helping each other. Sales of the plate benefit UO student scholarships. The limited-quantity offer is available on a first-come, first-serve basis to UO employees who request plate vouchers using an online form. Employees taking advantage of the offer will receive a plate voucher that covers the initial $40 special plate surcharge. After the free initial signup, users pay their standard DMV registration fee plus a $40 fee every two years for the special plates. The plate surcharge is an alumni association scholarship fundraising effort. Vouchers can also be requested for gifts to family or friends through the offer form. The vouchers are easily transferrable, and employees can request multiple vouchers until the limited supply runs out. Upon registering for the special offer, employees will receive their requested number of vouchers. Plates will soon go into production and will be available in early 2019. At that time, voucher recipients will be notified and can redeem their vouchers for plates at a DMV office. The offer is not retroactive to previous purchase of the plate vouchers, and previous purchases are not refundable, but additional vouchers can be requested at no cost. See the UOAA website for more information about the plates.